For Berlin Flowers I initiated community collaborations among 500 participants in order to decorate three buildings in Berlin with garlands: Schwedenhaus in Hansaviertel (former West Berlin), House of World Cultures (former West Berlin), and St.Johannes Evangelist Church (former East Berlin). The three buildings were originally intended to accommodate social gatherings. A so-called Gesellschaftsraum (a social room) in the Schwedenhaus was turned into an expensive apartment; House of World Cultures, a former congress hall, is today a museum; St. Johannes Evangelist Church has held no regular services since the 1970s. This project reconstructed the three community meeting points and represented visual languages interwoven by each neighboring community. Hansaviertel and House of World Cultures celebrated their 50th anniversaries in 2007. Special thanks for Annette Mächtel, Folke Köbbernig and Martin Kaltwasser. 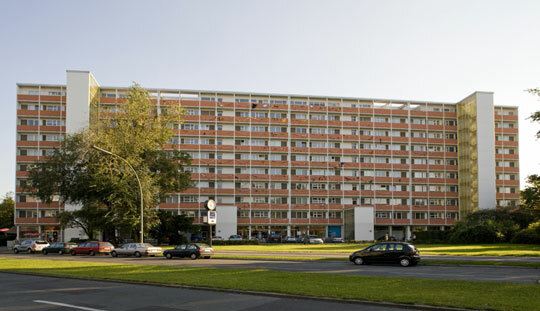 The Hansaviertel housing project was built between 1957 and 1961, as a response to the lack of apartments after the World War II. Internationally renowned architects such as Alvar Aalto, Egon Eiermann, Walter Gropius, Oscar Niemeyer, etc. were invited to design the complex. In 1957 the architecture exhibition, Interbau, opened its door to the future tenants, as well as guests from overseas. The Schwedenhaus was designed by Fritz Janicke and Sten Samuelson. Designer vs. users discourse is found here: The Bauhaus architects requested that the building’s north façade be kept “clean” i.e. 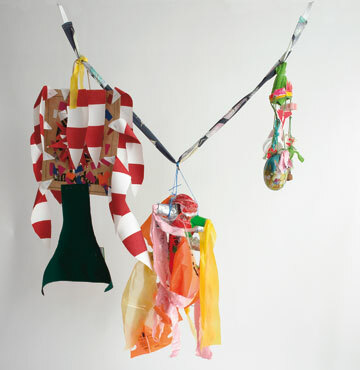 free of all personal belongings, in order to best present their design. Of the 25 days of the workshop period, it rained for 15 of them. 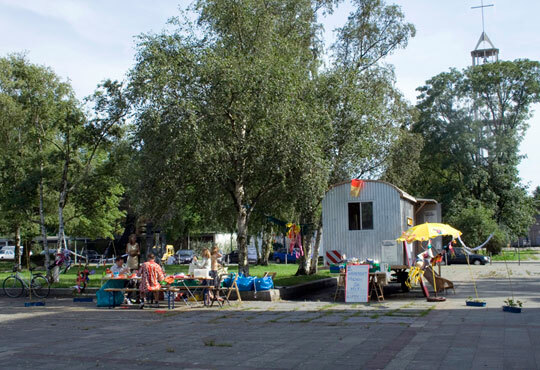 Workshops took place in the Hansa Library, entrance hall of the Aalto Haus, in a trailer home “Bauwagen”, an art project by Berlin based artists Köbbernig and Kaltwasser.